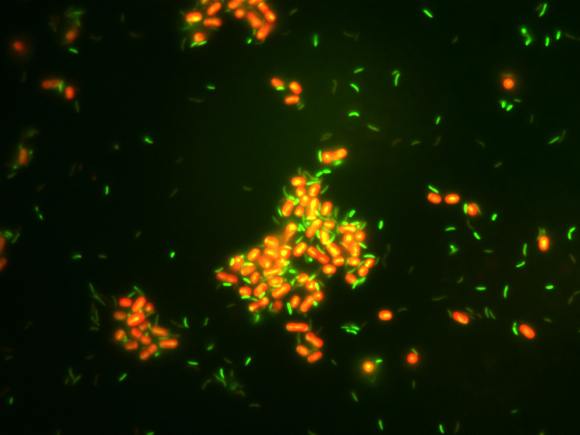 PNNL and The Pennsylvania State University are studying Synechococcus, a promising cyanobacterium (the yellow-orange cells) that could be used to determine optimum growing conditions for biofuels. Enlarge Image. Results: Rapidly growing bacteria that live in the ocean and can manufacture their own food hold promise as host organisms for producing chemicals, biofuels, and medicine. Researchers at Pacific Northwest National Laboratory (PNNL) and The Pennsylvania State University are closely studying one of these photosynthetic species of fast-growing cyanobacteria using advanced tools developed at PNNL to determine the optimum environment that contributes to record growth and productivity. Their work on how the cyanobacteria respond to different wavelengths of light, as critical resources, recently was featured in Frontiers in Microbiology. Why It Matters: Using biofuels based on cyanobacteria on an industrial scale could lower pollution levels from fossil fuels, provide a sustainable source of energy, and curb energy dependence. The challenge has been to find the right organism that can be cost-effectively grown quickly enough to meet industrial demand. The strain of cyanobacteria researchers studied, Synechococcus sp. PCC 7002, grows at rates that rank among the fastest reported for photosynthetic microorganisms. With a better understanding of how the cyanobacterium adapts to changing environmental conditions, researchers are able to optimize growth and productivity. "Understanding the fundamental underpinnings that determine growth rates of cyanobacteria provides an insight into the biological blueprint of photosynthetic organisms," said PNNL's Dr. Alex Beliaev, the lead scientist on the project. Dr. Hans Bernstein, a Linus Pauling Postdoctoral Fellow at PNNL who helped lead the study, added, "A deeper understanding of the basic biology for this organism is helping us develop solutions for efficient renewable energy production and will ultimately help us develop novel technologies based on microbial communities." Scientists at PNNL compare culturing conditions in samples generated from a novel cultivation approach: binary cultivation in photobioreactors. The approach uses binary cultivation inside photobioreactors to facilitate growth by creating a closed system where the metabolic by-products of one organism are used to fuel metabolism in the other. Enlarge Image. Methods: Researchers used an advanced photobioreactor, custom-built by PNNL, to allow this kind of study for the first time. The continuous system simulates a natural environment for an organism, allowing scientists to vary things like food, water, air, and light. In this study, researchers closely followed the growth rates of the cyanobacterium under pigment-specific light delivered from arrays of light-emitting diodes. Scientists exposed suspensions of the cyanobacterium to orange light, red light, and a combination over a period of weeks. They discovered that the organism expresses and regulates different molecular machinery to process orange light versus red light, while a combination of the two pigment-specific light sources yielded the highest growth rate overall. What's Next? 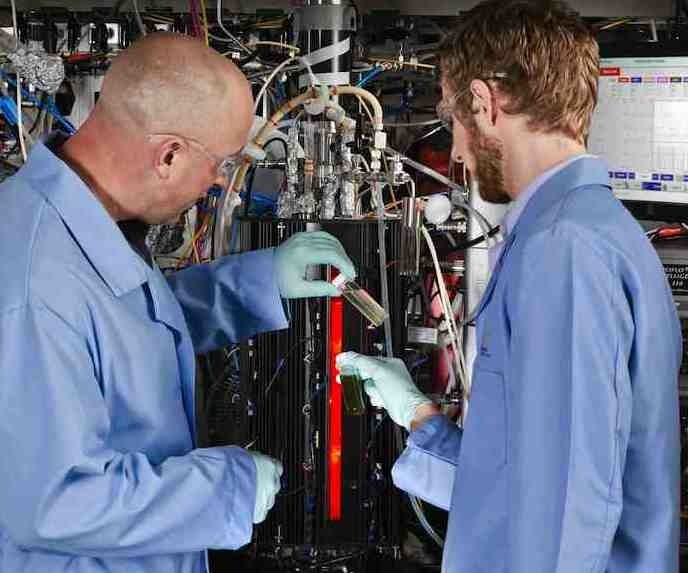 The PNNL team is advancing the understanding of cyanobacterial biology and ecology, not only for single-organism-based technologies, but as engines that will drive entire microbial communities, enabling development of more advanced biotechnologies in areas such as fuels, medicine, and industrial processes. Sponsors: The U.S. Department of Energy's Office of Science, Biological and Environmental Research funded this project via the Genomic Science Program. Reference: Bernstein HC, A Konopka, MR Melnicki, EA Hill, LA Kucek, S Zhang, G Shen, DA Bryan, and AS Beliaev. 2014. "Effect of Mono- and Dichromatic Light Quality on Growth Rates and Photosynthetic Performance of Synechococcus sp. PCC 7002." Frontiers in Microbiology 5:488. DOI: 10.3389/fmicb.2014.00488. Research Team Hans Bernstein (a 2013 Linus Pauling Distinguished Postdoctoral Fellow at PNNL); Alex Beliaev, Allan Konopka, Matthew Melnicki, Eric Hill, Leo Kucek (PNNL); and collaborators from The Pennsylvania State University, including Gaozhong Shen, Shuyi Zhang, and Donald Bryant.